The purpose to this post is to provide Jeep owners with a means to run DTC without the need for a scan tool. Although this procedure is not as useful or effective as a scan tool, it may help reduce some stress when you find your MIL illuminated while off the grid. This procedure is fairly straight forward and, to my knowledge, will work with all Chrysler products dating back as far as the 1980's -the oldest models require counting the duration and number of flashes produced by the CEL, then cross referencing them to a DTC list. 1. Cycle the ignition switch on and off three times, halting at the “ON” position. *Tip: You must cycle the key on and off rapidly while pressing the key into the ignition switch. If you move too slowly the odometer will indicate mileage, and you will need to start again. 2. If you have conducted the procedure correctly, all fault indicators will remain illuminated and six dash marks “------“ will display in place of the odometer mileage. 3. If DTC’s have been logged, write them down. You can cross reference your findings with the DTC list below. 4. 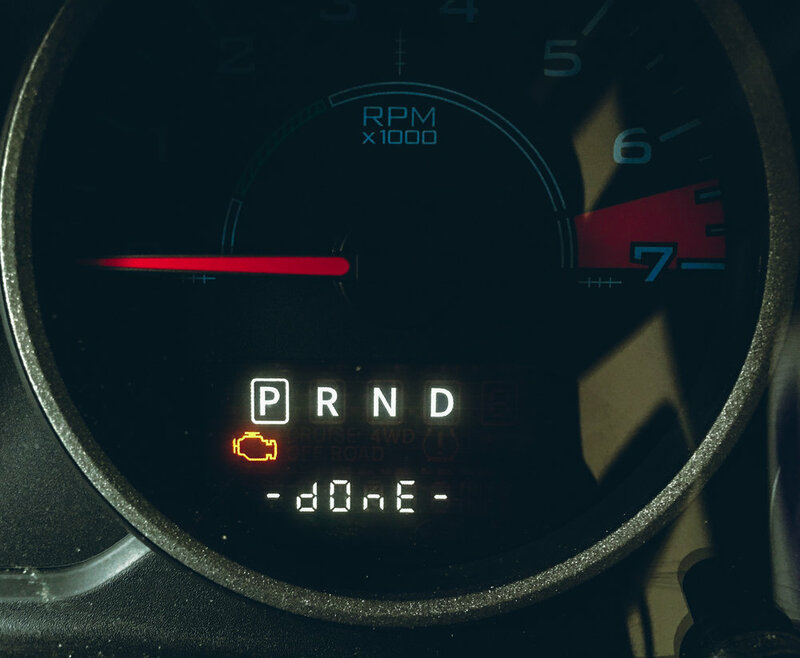 If no DTC’s have been logged, the dash marks will read “-done-“ indicating that the scan is complete. 5. Of course, Chrysler/Jeep does not provide a means for resetting MIL’s, this process is for reading codes only. This will need to be done with a scan-tool once the appropriate repairs have been completed. 6. Some repairs will automatically turn off the MIL after a certain number of engine run cycles. However, the DTC will remain stored until it is cleared with a scan tool. It is important to clear DTC’s after a repair to prevent confusion when dealing with future MIL triggers. 7. Some repairs may require calibration using an appropriate scan tool.